You all have been kind and encouraging when it comes to this move and settling in to a new place. I wanted to give you a look at the family room from the beginning. This is the fireplace wall when we first saw it in April - before we bought the house. The picture below was a couple of weeks ago. I love having some shelves to play with. it needs to be surrounded by some pretty things. this is my leopard chair. On the wall you can see a grouping of black and white pictures. This was inspired by Kelly at Talk of the House. The girl has black and white pics everywhere! I love them. On the coffee table we have lots of magazines. A larger view of the area. A favorite lamp on some decorating books. Again you see the drapes made by Sonya. And from this corner you can see into the master bedroom. Still want to add pillows and a few accessories. Love your new family room and all the touches you have made! Your TV niche looks wonderful and your richly colored wood floors are beautiful! 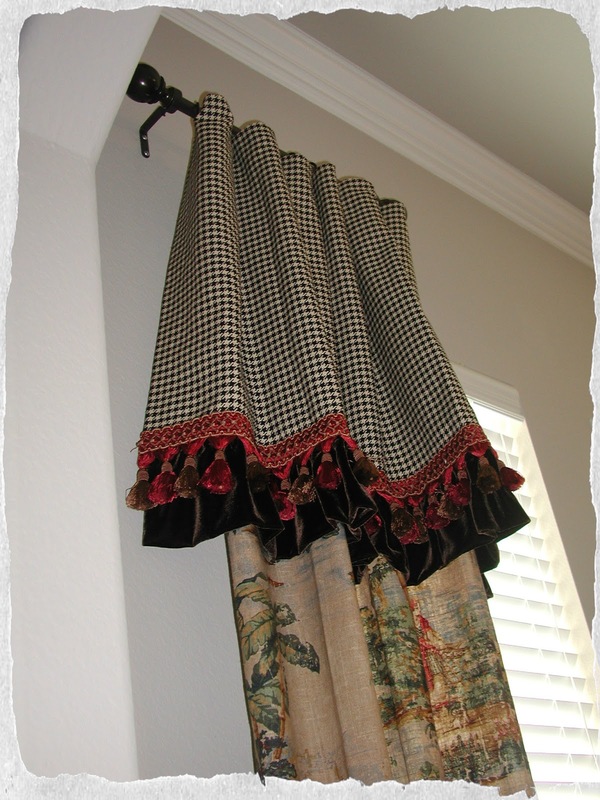 Sonya's custom drapes are simply gorgeous! Hope you have a blessed Thanksgiving with your family! Can't wait to see the Christmas poofing!!! Looking great, Stacey! What a smart way to fill that niche. Glad it's feeling more like home for you! Your family room is beautiful! You've come a long way. I love the photo gallery and the shelves are perfect for the niches. What a comfortable, cozy room! How pretty, Stacey! I love the shelves you put in over the TV. What a difference they make. Your room is just so beautiful and I wish you and your family a very blessed Thanksgiving. Stacey, it is BEAUTIFUL!! I love it! And the curtains by Sonya are gorgeous! She is SO talented! I love love it! Stacet, things are coming along beautifully! Sonya did an amazing job on the drapes! You'll have fun decorating for Christmas, too! Stacey it looks beautiful! We have the same taste! You have a beautiful home! I love how you put everything together. The drapes you had made are just the perfect finishing touch. I know you're going to love your first Christmas in this house. Love it! How fun for you to decorate with a clean slate! It is homey! And SO elegant. I love how you have made it your own! Can't wait to see what you do for Christmas. Wow! You really made some changes fast. Love the way you used the niche. That rug is fantastic. Your home is looking so comfy and cozy. Your touches of red are so warm. 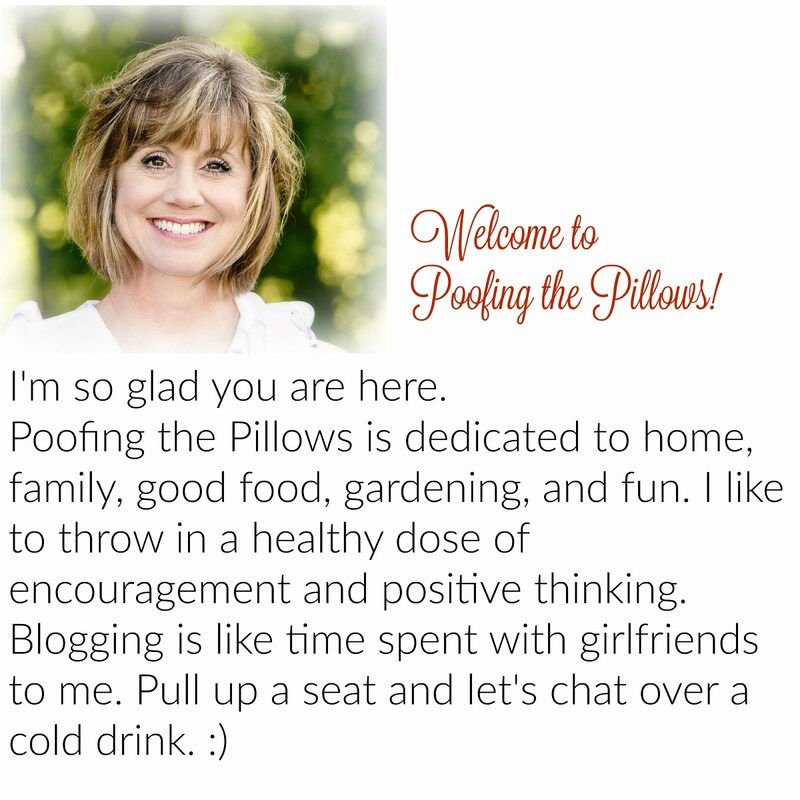 Can it possibly time for Christmas poofing? Happy Thanksgiving. Stacey, it's really coming along! Everything looks great. I love your details, like the lamps on the books, and especially the wall of black and whites. Can't wait to see more! Congrats for moving back to your home town. You room looks so pretty, and like what you did with the niche. I really like your rug. Everything looks so very nice. Thanks for stopping by and letting me know you liked my Burlap Wreath Drop Cloth Curtains. Your family room looks so cozy and beautiful!! Love your gorgeous drapes! I hope you have a Happy Thanksgiving! You have managed to blend beauty and comfort. I would love to spend some time in that room....so clean, fresh and pretty. Thank you for giving us a glimpse into your beautiful home. You have the best decorating sense, and I love how you incorporated touches of red into the room. What a lovely looking room to curl up in and read a good book. Perfection in every room, Stacey ... and so warm and welcoming. I know you are enjoying all your hard work.